Karen is such a great lady that God made two of her! What I mean to say is that Karen has an identical twin, but I like the first sentence better! Karen and I met a long time ago because our children went to the same schools. Karen’s children are a little bit older than mine and since I was new to Ashland, she was a great support for me. I’ll bet that if you asked anyone that knows Karen what she is like, they would tell you that she is friendly, cheerful, thoughtful, and most certainly, a woman you can count on. When my son Coco was in kindergarten, he jumped off a play structure at school and bit his tongue. I was at work and did not find out about it until about an hour or two later. When I asked him to show me his tongue, he just shook his head no. When I took him to Helman Elementary to pick up his sister, I saw Karen. I told Coco that Karen worked in medicine and asked him to show her his tongue. Immediately he opened his mouth and we both saw the huge gash. Karen urged me to go to see Jack the Pharmacist at Ashland Drug right away. Everything eventually worked out fine… Coco took antibiotics for a week, his tongue healed, etc. But what amazes me still is that he was willing to show her his wound, but not me! Another memory I have of Karen demonstrates her insistence for doing the right thing. It seems that one of her boys (I forget which… and really, it doesn’t matter) and his friends decided to participate in some mischief (involving eggs and toilet paper). A local policeman found them and called Karen to come and pick up her boy. When she arrived she spoke to her son and then apologized to the police man for the incident and asked when her son could clean things up. The officer was stunned. He said usually parents yelled at him for “picking on” their kids; few of them ever took responsibility for their actions. When my own son got into trouble, I had a good role model to follow with Karen. These are just a few of the stories I have to share about Karen. Oh… and in addition to all that, she raises lambs! What a wonderful lady… and to top it off, her husband Bob is a pretty great guy in his own right. 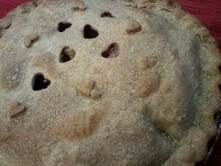 Tonight I brought an Apple Blackberry Pie to Karen and Bob. I want to recognize them both for all that they have done in our community and to let them know that we feel so lucky to count them as friends.